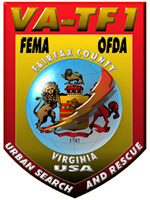 Established in 1986 as a domestic and international disaster response resource, sponsored by the Fairfax County Fire and Rescue Department, Virginia Task Force 1 is rostered by approximately 200 specially trained career and volunteer fire and rescue personnel, with expertise in the rescue of victims from collapsed structures, following a natural or man-made catastrophic event. The team is comprised of emergency managers and planners, physicians and paramedics and includes specialists in the fields of structural engineering, heavy rigging, collapse rescue, logistics, hazardous materials, communications, canine and technical search. Virginia Task Force 1 has partnerships with the Department of Homeland Security/Federal Emergency Management Agency for domestic response and the United States Agency for International Development/Office of U.S. Foreign Disaster Assistance during international missions. As a part of the Fairfax County Fire & Rescue Department, the task force maintains constant operational readiness as a local resource for residents of Fairfax County and surrounding jurisdictions. We invite you to view our web site to learn more about our Department, our community and our team.